On the 26th of January 2018, Medetalk along with Anvitha tours2health and advisories invites you for the fourth Medetalk event at the Lalit Ashok hotel, Bangalore. Through this international event we are striving to provide a vast podium for discussions relating to health care and digital marketing. 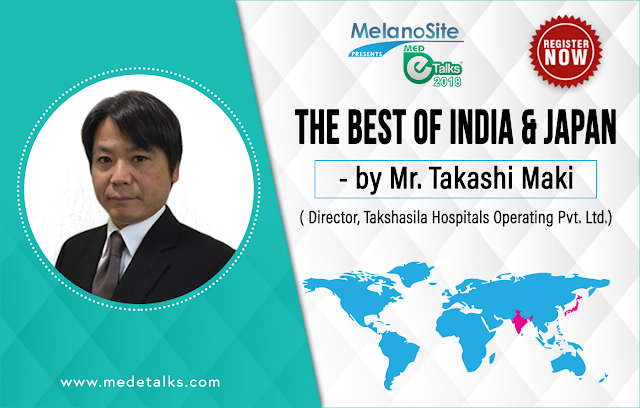 Our honorable speaker, Mr. Takashi Maki is the director for Takshashila hospitals operating pvt. Ltd also known as Sakra world hospital in Bangalore, and he is the director of SECOM medical systems co., ltd, Tokyo. India, a land where age old medicinal practices are still beneficial, improvised and practiced. On the other hand japan is a country where the advancement of technology is a daily event. We have Mr. Takashi Maki, who will be representing the very notion of the best collaborations between the two countries. Trans-National Stature of Ayurveda - Need Ambassadors!